These fun and functional wedding favors come in several styles and can be personalized with monograms, icons, and more. You can even personalize with a color that matches or is close to your wedding colors. 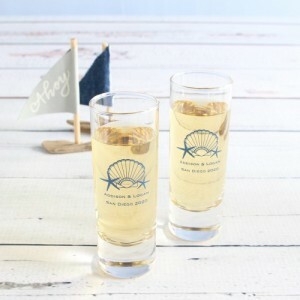 The shot glasses would also be fun as part of a welcome package – maybe paired with a bottle of locally made spirits! No matter how you choose to give these shot glasses to your guests, they’re sure to have a good time toasting you! You’ll find these personalize shot glasses here.